The 1976 Tour de France was 4,016 km long and raced at an average speed of 34.514 km. There were 130 starters and 87 classified finishers. Eddy Merckx did not participate. Climbing specialist Lucien van Impe recognized that the particularly hilly nature of the 1976 edition was a rare opportunity to try to win the General Classification rather than the climbers' title. Van Impe's success is generally attributed in no small part to the tactical assistance given to him by his director, Cyrille Guimard. Freddy Maertens' 8 stage wins in a single Tour tied Charles Pélissier's and Eddy Merckx's record. To save you some Google time, "Le Touquet Paris Plage" is a French beach resort on the English Channel. Stage 5A: Tuesday, June 29, Louvain 4.3 km Team Time Trial. The teams were racing for individual time bonifications awarded to the three best teams: 10sec, 6sec, 3sec. Viejo's 22min 50sec is the largest post-war gap earned in a solo break. Régis Ovion. Was first in stage, but positive for dope. Tierlinck and Panizza advanced to first and second places and no third place awarded. Eddy Merckx started 1976 by winning MilanSan Remo for a seventh time. He also won the Catalonian week. But that was it for Merckx in the win column for spring in 1976. He managed a second place in the TirrenoAdriatico stage race, but only sixth place in ParisRoubaix and LiègeBastogneLiège. In the Giro, he came in eighth. Not able to find his usual form and needing surgery for saddle-sores, he did not enter the 1976 Tour. There would be no rematch between Bernard Thévenet and Eddy Merckx that year. There were plenty of other fine young cannibals, however. Bernard Thévenet went to the Tour fresh off a win in the Dauphiné Libéré. Luis Ocaña, looking for another shot at glory, had come in second in the Vuelta and fourth in ParisNice. Joop Zoetemelk was the odds-on favorite. He won Flèche Wallonne and had high placings in the Dauphiné Libéré, Amstel Gold and the Tour of the Mediterranean. He had been second in the Tour in 1970 and 1971 and had never finished worse than fifth. Every Tour is different. Each year the cast of players changes slightly as older racers retire and new young men with fresh ambitions arrive. The route changes each year as well and with differing emphasis on flat roads, time trials or mountains different racers can find some years suit their talents more than others. 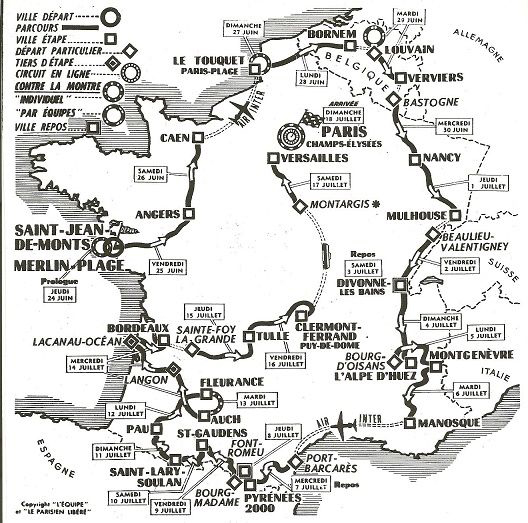 The 1976 Tour was clockwise, starting on France's west coast, circling north up to Belgium before heading south for the Alps. There the 1976 Tour departed from tradition. Normally after one of the 2 major mountain ranges are ridden there are several transition stages before the hard climbing resumes. This year there were 5 days of climbing in the east, starting in the Vosges in stage 7 and ending in stage 11. Then there was a rest day before 3 very hard days in the Pyrenees. That was 8 days in a row of mountains. If that weren't enough, stage 20 finished at the top of the Puy de Dôme. Importantly, 5 of the mountain stages ended with hilltop finishes. This is a huge advantage to smaller riders who don't have the power to maintain a time advantage gained on a climb through a long descent and flat roll-in to a distant finish line. No wonder Lucien van Impe announced that he would be riding this Tour for the overall win, not his usual King of the Mountains title. Van Impe's changed circumstances involved more than just having a race itinerary that matched his talents. His previous manager was Jean Stablinski who is often credited with having one of the finer tactical minds in cycling. Stablinski was replaced with Cyrille Guimard who had mounted a real threat to Merckx in the 1972 Tour. Guimard was so recently retired that he was still the 1976 French cyclo-cross champion. In taking over the Gitane-Campagnolo team he remade the squad so that van Impe would have better support. As we'll see in unfolding years, Guimard not only knew how to ride and win his own race, he knew how to get others to ride and win for him. There was a new comet in the heavens. Belgian racer Freddy Maertens turned professional in 1972. His fantastic sprinting, time trialing and overall strength let him win all but the steepest races. In 1976, the first year he rode the Tour, he won 54 races including the World Pro Road Championships and the Belgian Road Championships. His erratic career was at its peak in 1976 and 1977 before it fell off to almost nothing. Then, in an astonishing act of will, he rebuilt his career and won the 1981 World Championship. Maertens did not disappoint Belgian fans who were unhappy with the absence of Merckx. From the gun he was on fire. He won the prologue time trial and the first stage. Then he won the stage 3 time trial, beating such accomplished chrono men as Ferdi Bracke by 2 minutes, 23 seconds, Raymond Poulidor by almost 3 minutes and Bernard Thévenet by 3 minutes, 32 seconds. When the Tour entered the Vosges mountains he won stage 7. In stage 8, he managed only second to Peugeot's ace sprinter Jacques Esclassan. In Yellow, Maertens rides to victory in the stage 3 individual time trial. Van Impe, Zoetemelk and Thévenet were sitting at about 4 minutes behind Maertens. Stage 9 was 258 kilometers that had the pack ascend the Luitel before finishing at the top of L'Alpe d'Huez. Even sprinter Freddy Maertens made it over the Luitel with the good climbers. But when Peugeot rider Raymond Delisle opened the hostilities on the Alpe, Maertens was tossed. From then on Zoetemelk and van Impe attacked and counter-attacked each other all the way to the top with Zoetemelk getting the win by 3 seconds. Poulidor, Thévenet, Baronchelli, Kuiper and the others were what a modern military man would call "collateral damage". They were incidental victims of a relentless shooting war between the 2 best climbers of the day. The result of the day's brawl was that van Impe was in Yellow with Zoetemelk trailing by only 8 seconds. Maertens was third, down about a minute. 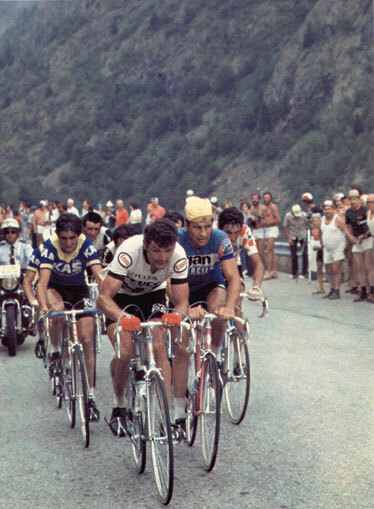 Stage 9: Thévenet leads the chase, van Impe and Zoetemelk have flown away. Poulidor rides to his left. The next day was another mano-a-mano climbing fight between the 2 leaders. After ascending the Lautaret, the Izoard, and the Montgenèvre, Zoetemelk was again only able to beat van Impe and Thévenet by 1 second. Zoetemelk now trailed van Impe by only 7 seconds in the Overall. The pace was so hard 7 riders were eliminated for failing to finish within the time limit. The third mountain stage was one of those races in which the peloton just doesn't feel like racing. They let José-Luis Viejo ride away without being chased. His final margin of victory, 22 minutes, 50 seconds, was the Tour's largest postwar solo winning margin. The peloton was content to rest their tired legs. Indicative of the slower pace, sprinters Gerben Karstens and Freddy Maertens took second and third places. The first stage in the Pyrenees, the fourth mountain stage, was another odd day. Van Impe and Zoetemelk were only worried about each other. They kept an eye on each other and let Raymond Delisle, an excellent but slightly aging racer, get away. Delisle was eighth in General Classification when the stage started. When it was over, Delisle was in Yellow and van Impe and Zoetemelk were almost 3 minutes behind. The next stage didn't affect the standings. The big guns held their fire. The only notable event was that stage winner Regis Ovion failed his drug test and his name was stricken from the record of that stage. Willy Tierlinck was awarded the stage. 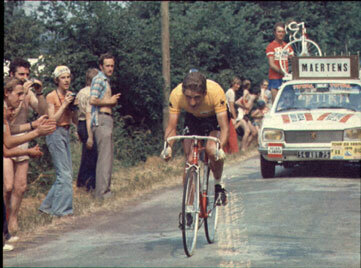 Stage 13: Delisle in Yellow with Poulidor (in GAN jersey). It was stage 14, the fifth of these mountain stages, that made history. In previous Tours, van Impe had already won 3 of his eventual 6 Polka-Dot climber's jerseys, in the same fashion as modern riders Laurent Jalabert or Richard Virenque have done it. They would go out early on a mountain stage and scoop up the points in all the early mountains, not always worrying about getting caught and dropped on the final climb by the men seeking overall victory. The Polka-Dot jersey was generally van Impe's entire ambition. In later years he has said that he regrets those years in which he turned to trying for the overall victory. He thinks he might have had 10 Climbers' jerseys instead of his 6. There were 4 major climbs that day. On the second, the Portillon, Luis Ocaña attacked. Ocaña was no longer the dominating rider he had been in the early 1970s, but he was not to be ignored. Cyrille Guimard, van Impe's director, told van Impe to go after him. Van Impe was reluctant: Guimard and van Impe did not completely agree on tactics and goals that year. Guimard told van Impe that if he didn't go after Ocaña, he would run him off the road with his car. Van Impe took off and caught Ocaña on the Peyresourde, the day's penultimate climb. Zoetemelk didn't chase him. He may have thought van Impe was chasing some Climbers' points and not really going after the overall lead. And surely by now Ocaña was nothing more than a shell of his former self. Instead Zoetemelk sat on the wheel of the man whose Yellow Jersey was threatened by the attack, Raymond Delisle. Normally this would be an astute strategy, forcing the leader to defend his position. It would have been astute except that Delisle could not close the gap. In fact, Delisle was exhausted and eventually lost over 12 minutes that day. Up the road, van Impe and Ocaña were flying. Ocaña did the hard work on the flat road leading to the final climb, towing van Impe. Ocaña remembered that Zoetemelk had never helped him in his struggles with Merckx. This was a tough bit of pay-back. On the final climb, the Pla d'Adet up to St.-Lary-Soulan, van Impe jumped away from Ocaña and won the stage and the Yellow Jersey. Zoetemelk came flying up the hill, going faster than van Impe, but it wasn't good enough. He was 3 minutes, 12 seconds too late. The Ocaña/van Impe/Zoetemelk attacks shattered the peloton. 45 of the remaining 93 riders finished outside the time limit. Peter Post, the manager of the Raleigh team asked on behalf of the riders that the Tour management waive the elimination rule for the stage. They did. The final day in the Pyrenees, even with the Aspin, Tourmalet and the Aubisque, didn't change the top of the standings. The lions had to digest their kill. The stage 17 time trial showed that van Impe was a more rounded rider than one might expect. Ferdi Bracke won it but van Impe was able to beat Zoetemelk by more than a minute. That put Zoetemelk 4½ minutes behind the Belgian climber with only one more chance to take the Tour leadership, the stage 20 climb to the top of Puy de Dôme. Zoetemelk won the stage, beating van Impe by an unimportant 12 seconds. Impressive, but to no real effect. That moment of careful, conservative calculation on the road to St.-Lary-Soulan cost him the Tour. Zoetemelk was the better climber, but van Impe had the tactical genius of Guimard to give him the needed push. Thévenet had been losing time and at stage 19 he finally abandoned, weakened by hepatitis. Lucien van Impe won the Tour, beating Zoetemelk by 4 minutes, 14 seconds. It was his only Tour victory and he remains the last Belgian to win the Tour. To this day, he is troubled by Guimard's remarks that van Impe would not have won the Tour without his encouragement and threats. Van Impe says that Guimard talked to him as if he were a child, and after the 1976 season, van Impe changed teams. Freddy Maertens won 8 stages in the 1976 tour, equaling the record set by Charles Pélissier in 1930 and Merckx in 1970 and 1974. And Raymond Poulidor? The great man finished third, 12 minutes, 8 seconds behind winner van Impe. This was the fourteenth and final Tour de France for the 40-year old Poulidor. He abandoned only twice and finished with 3 second places and 5 third places. 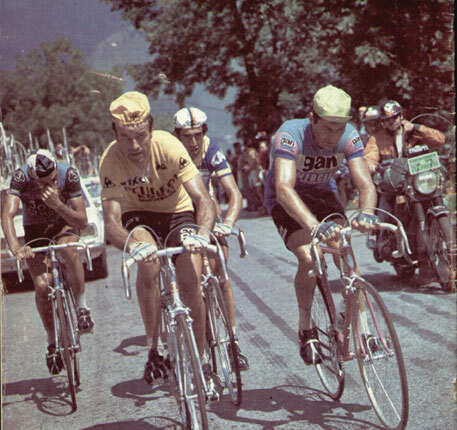 In all those years of riding the Tour from 1961 to 1976 he never spent a single day in Yellow, not one. Celestino Vercelli, riding with G.B. Baronchelli, Walter Riccomi and Wladimiro Panizza on the SCIC-Fiat team, talked to us about the 1976 Tour: "This was the year the Cannibal Eddy Merckx stayed home. This Tour was won by van Impe. Every stage of this Tour was very, very hard. Just to get an idea of the difficulties we faced, in Bordeaux, in incredibly hot weather, we raced 3 stages the same day. In the evening in the hotel (hotel is a big word for the place we stayed), we slept in big rooms together. I was running a high temperature, I was very tired and hot. I don't have words for that day on the bike. "When we were riding the Pyrenean stages, the asphalt melted. You can imagine the huge difficulties we faced riding in the mountains in the soft asphalt. In the descent the situation was better with the tires holding the soft road very well. The big problem was the difficulty in removing the asphalt from our legs in the evening."